Hey all! I am now contributing to Executive Homemaker! If you're NOT familiar with EH, it's a great location to find free printable goodies. There's also some excellent ideas, like how to throw a successful St. Patty's Day bash. 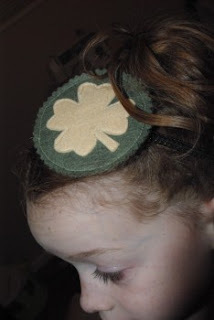 I have a tutorial up today on how to make this patch pin for St. Patty's Day. Use it for a headband, bag charm, or simply pin it onto your shirt to avoid the pinch. Go here to get the full how-to and free pattern! TOOO cute I just love this!